The history of North America, and the world in general, underwent a sharp change of direction at Coffin Hill. Whether it was the north or the south who performed the evocation in the midst of the civil war, both united to fight the result. "Ever since then," says Ten Shoes Dancing, "it's gotten weirder out here. England's getting invaded by elves and wyrms, India has bizarre flying machines, news out of Tibet is... terrifying. And these newly united States are much, much worse." This brand new, full colour graphic novel is something of a prequel to the first story arc, something of an explanation, but mostly a welcome return to the Kid's particular brand of mayhem. The Weird West is a well-established subgenre; even in comics, courtesy of such creations as DC's venerable Jonah Hex. What I think principally distinguishes the Eldritch Kid from its stable mates is its refusal to compromise on any aspect of its premise – either the Weird or the Western – and its paradoxical respect for history. Unusual too, is its assumption that the reader is sophisticated enough to care. Ten Shoes has signed on to guide a party of would-be prospectors to find their fortune in California. After meeting up with the Kid in less than auspicious circumstances, the whole party rolls out across the desert in search of the promised land. As you read, you may see omens as to the outcome. The Kid plays poker with a tarot deck, and the cards displayed are never random. The runes on the pistol are elder futhark (according to my book: wealth, elk, harvest, sun, gift, water, horse, possession, ice and the god Ingwaz). And a smattering of Norse/Danish might not go astray – though the key phrase is "Ravneherre", as in "lord of ravens". Magic forms an important part of this story: not as a special effect, but as a philosophy. This is a milieu where power comes exactly commensurate to price and debts must always be paid. It is this, and the author's adept handling of the theme, that integrates the disparate magical systems involved into a workable whole. To transplant different mythologies into foreign soil is always a risky game, but this is one book where it pays off. The less palatable aspects of history too, are invoked. Entrenched racism, casual cruelty, massacre and just plain opportunism all take their place and are once again integrated with the more fantastic elements, rather than being placated or disguised by them. But the overall tone of the writing is one of black humour. This exists substantially in the dialogue. The Kid's laconic understatement ("Ever been afeared to do something you know as you should do?" is about as impassioned as it gets) spars with Ten Shoes' fine sense of irony. I don't hesitate to call Ten Shoes the heart of the piece, and find him a truly special character. Here, Christian Read demonstrates all the wonderfully nasty perception of his other work in this medium, such as "Burning", his entry in Character Sketches (Gestalt Publishing 2007, with Shaun Tan, Justin Randall and others) and old favourites The Watch and Dunwich. His words are complimented by Maier's art. Its sketchy, sepia delicacy is the main difference between the Kid of 2004 and now. That this is apparently Maier's first published comics work is astounding, for he has the trick of providing exactly the right amount of detail to focus the eye, and nail down the meaning of a panel. Furthermore, he gives the most hideous acts and creatures an aesthetic quality stemming from this detail. The layout I found clear, the story flowing naturally from panel to panel. Even someone who reads comics as infrequently as I has no reason to fear the quite lengthy sequences sans dialogue or subtitles – although some credit must be given to the guiding presence of Lord Hnaska! 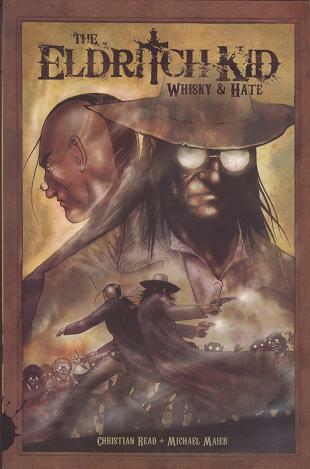 The 2004 story arc provides a broader view of the Kid's myth-plagued world and hints at the Kid's real place in it all – a question that, as prequel, "Whisky and Hate" does leave open. Read together, they suggest an epic tale cycle, rather than detailing every time the duo killed a gorgon or went drinking with the ghost of Sir Francis Dashwood. Which works for me: although I would welcome a further instalment that might perhaps resolve their fates. In summary, the Eldritch Kid is a complex and meaty creation, brought off with thoroughly professional panache. It has the substance to appeal to a broad range of readers, and deserves to be better known.